Ok, I've been reading a lot of review copies (which all looked interesting to me and came available in the last month or so!) because I've been working on a very long tome (Atlas Shrugged) of late. That means I'm reviewing shorter books (mostly review copies) until I finish Atlas. However, this past week I've been recovering from fluid build-up in my ear (who. knew. that an inner ear problem could cause so much pain!?) and yesterday I found myself lying on the couch wanting to do nothing but sleep and read fluff. I did both. Prior to December I picked out The Gift of Christmas as my personal Christmas read. I have read two others by Debbie Macomber which I liked and so I wanted to try another. While I liked the others, this one tried my patience. Remember how I said that my pain tolerance is rather high when it comes to Christmas books? I'm almost delighted to tell you that apparently there is a limit to what can be endured. I cannot abide this book. It made me to feel that I'd just as soon avoid her books in the future. The Gift of Christmas tells the story of Ashley Robbins, a twenty-something year old English teacher who has been in love with her mother's employer, Cooper Masters, since she was 16 years old. (Her mother is Masters' cook and housekeeper.) Cooper is so far out of her reach though that she doesn't believe that she has a chance in the world at ever marrying him. He is a wealthy business man, roughly 40 years old, and travels in completely different circles. Yet, they have a common bond of a godson and this gives them a distance sort of relationship. The book is supposed to describe a relational tension between the two and leave you feeling breathless over whether or not they will or will not ultimately "get together." However, it's so predictable you know it's going to happen. Aside from being predictable, it is also completely ridiculous. To say that there is character development in this story would be laughable. From page two Cooper Masters is sighing because he wants to kiss her and yet is cold and distant because he feels the age gap. He kisses her anyway. From there the book is filled with the two of them misunderstanding each other repeatedly (to the point where you want to knock their heads together) and kissing to make up. The cycle is this: frustration, sighing, kissing, frustration, sighing, kissing, etc.. Nothing ever changes but the book ends on a happy kissing note. So I guess that's ...goodish. Except! I have no idea what Macomber's personal belief system is but she writes Ashley up to be a Christian. Ashley is so Christian that Macomber notes that she does Christian workout DVDs in her home. She carries a Bible in her purse which she whips out from time to time. She goes to church and hugs babies. And, to be very, very safely righteous, she only works out with Christian exercise DVDs. Problem: Cooper Masters is not a Christian. He is just not sure about this "God thing." But this does not prevent Ashley from pursuing a sighing, kissing - yet frustrated! - relationship with him in hopes that he will fall desperately in love with her. This, in spite of the fact that she had a previous boyfriend who was not a Christian who she had felt compelled to break up with because she knew that this other guy's lack of faith was problematic. She suffers no hesitations about Cooper Masters though, because he is handsome and he sighs a lot. The author of her fate, (referring to Macomber, of course), kindly makes Masters a Christian in the end, thus solving any faith problems. And because I disliked this book so much so as to not to care about offering you spoilers, he even proposes to her by using a Bible. Because it's just that good. When I finished this book, not only did my ear hurt but so did my head. Christmas read fail. 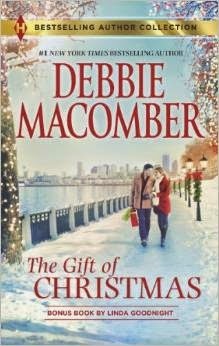 Debbie Macomber is struck from my list. Well, Carrie, you are an alchemist. You transformed your frustration and disappointment, yea verily, your embarrassment, into my delight and entertainment. This was a fun review to read! I can relate to the pain of realizing you just wasted time and money on subpar reading. I hope your next comfort book is better. You had me smiling with this one. I have only tried Macomber once, and it was one of the few books I didn't finish. It was about a group of diverse ladies learning to knit together - what could be cozier than that? But when it got into some very specific and detailed sexual encounters, I was astonished and tossed it aside. I don't know what her belief system is, either - someone suggested this might have been one of her earlier books, but if I were her and had written such things in the past and had become a Christian or gotten convicted about them in the meantime, I think I'd do all in my power to make sure those older books went by the wayside. Maybe that's not possible once you sell a book - maybe the publisher owns the rights to it. In that case I'd have a page on my web site explaining why I had changed and don't write that way any more. I know of a couple of authors who have done something like that. Hope your ear is feeling better. Sorry to laugh at your pain and embarrassment, but I couldn't help it. I haven't had the same patience with Macomber that you've had in the past and can just imagine this fluff. I listened to most of one. Once. It got a bit too steamy for my taste, though maybe it was stopped. I'm sorry for your pain, both in ears and in head, though the post did make me smile. I've never read any fiction by this author but I did read a non-fiction one about noticing those people that God brings into our lives and the gift they leave with us and how we can be a blessing to others, can't remember the name of it but I remember enjoying it. Too funny! I have one Macomber on my shelf - Blossom Street Brides that I got from LibraryThing. Not sure why I requested it, but since I won it I will have to read and review. Hopefully it won't be as taxing as your book! Keep up the good work and hope you are feeling better. I've only read one Macomber book, but I think my thoughts were pretty neutral on it. I saw this one as a giveaway on another site. Fortunately for me the first few words in the description contained "harlequin" so I just buzzed right on by. I have been doing pagan workout DVDs this whole time. What kind of a believer AM I?! This is the WORST possible book. Teaching nice Christian girls to keep their options open for sighing non-Christian guys. Everything will end just perfectly because he'll always end up becoming a Christian in the end. UGHHH! Ahahahahahaha. I laughed so hard that Jeff paused his game and asked what was so funny. I read him your review and he rolled in laughter. So yes, you brought much joy to our home tonight. ;) Barbara's comment mentioned knitting - yes! That's why I recognized her name. I think I read a couple of the knitting books but ended up deciding that they weren't worth my time. How funny that you discovered it was a Harlequin book. So it never got steamy enough that it made you wonder who published it? Must have been one of their more mild books! I'm ashamed to say I read a few Harlequin novels back in the day. Yuck. Never again.